Why is Aurora Camacho de Schmidt so tranquila? Because she retired from Swarthmore this summer after more than 20 years of teaching Spanish language and Latin American literature. Because she is as well-known for her activism and efforts on behalf of immigrants and indigenous peoples as she is for her love of testimonial literature and the poetry of resistance. Because she traces the roots of her activism to her exposure to teachings by dissident Jesuit priests at Universidad Iberoamericana in Mexico City who were framing the principles of liberation theology before it had a name. Because she studied philosophy at the urging of her parents, who thought a Jesuit institution would insulate her from the social and political upheaval of the 1960s (it had the exact opposite effect). Because she visited one of those college friends, Alberto Ulloa Bornemann, in jail when he was a political prisoner and, 30 years later, translated his memoir, Surviving Mexico’s Dirty War, with her husband, historian Arthur Schmidt, for Temple University’s Voices of Latin American Life series. Because before coming to Swarthmore, she spent a decade with the American Friends Service Committee (AFSC), six of them as the founding director of the organization’s Mexico–U.S. Border Program. Because she left the border program to finish her dissertation on the Nicaraguan poet Ernesto Cardenal at Temple, then returned to AFSC as a writer, immigrants’ rights advocate, and policy analyst. Because she has sought to teach innovative and ambitious courses throughout her tenure—from “the other” in Latin American literature her first semester to last fall’s Mexican Pennsylvania. Because the titles of her courses testify to her interests and expertise, including The Literature of Social Movements in Mexico, Indigenous People in Latin American Literature, The Tyrant in Latin American Literature, La Frontera: The Many Voices of the Mexico–U.S. Border, and Children in Latin American Literature, among others. Because rather than approaching texts from a purely aesthetic point of view, she feels a great need to use them to illustrate the realities in Latin America in an interdisciplinary way. Because she knows, for some students, the texts raise moral questions that she does not pretend to have answers for and that for students to ask those questions is a healthy result. Because she knows that texts aren’t always enough to convey these realities and has brought several activists to campus to share their testimonies with students. Because in 1998, she took 12 Tri-Co students to Chiapas, Mexico, where indigenous people, the Zapatistas, had launched an insurrection four years earlier and were still armed. Because when she directed the College’s Latin American Studies Program, the knowledge and advice she freely gave made her the go-to resource for anyone contemplating study of the region. 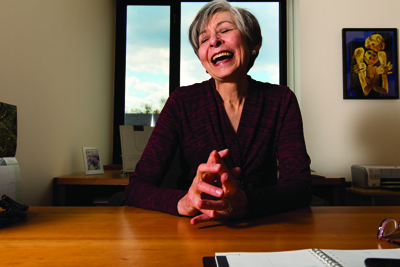 Because her commitment to Spanish-speaking students and their families extended to her efforts in 2011 when, in a makeshift sound booth in the Map House, she provided the College’s first live, simultaneous Spanish translation of Commencement. Because she composed a poem “out of despair” for Ravi Thackurdeen ’14, a student she had not taught, when he died last year in an accident in Costa Rica; she later read it at a campus vigil held in his honor. Because although she has published some poetry in Mexico, her greatest desire is to gather her poems and publish them now. Because she is not a disciplined poet, describing her need to write as a “compulsion” from which she is “liberated” once finished. Because after the symposium, she danced with her grandchildren to Los Parangaricutirimicuaros, Swarthmore’s mariachi band. Because each year, she commemorated the Day of the Dead with an altar on campus, making the customary bread for the occasion. Because her Mexican Pennsylvania class unwittingly provided a way for her to revisit the scholarship and issues—including detention, deportation, border crossing, women in migration—she had studied upon first coming to the United States, allowing her to connect both spheres of her self-described “unlikely” careers. Aurora Camacho de Schmidt made time this spring to answer a few questions posed by Director of Web and Media Communications Alisa Giardinelli. Who has been the greatest influence on you? My parents. Arthur Schmidt, my husband of 45 years. Pierre Teilhard de Chardin, a Jesuit palentologist and religious thinker. And the great poets of Latin America. Carmen is a character in one of Claribel Alegría’s novels. She can learn, grow, accept different truths in her life, and adjust her thinking even if it’s very costly. Do you have a real-life hero? Lots. Moviemakers, actors and actresses, musicians, many people. What is your favorite way of spending time? With my family and friends around a table with good food, wine, and conversation about movies. A small collection of sea-battered shells my husband and I gathered in the Outer Banks on our 25th anniversary. They are all broken—and beautiful. What is your most obvious characteristic? Taking time to do things. What is the trait you deplore in yourself? I can be too concerned about things that don’t matter, like having a clean house! Any trip to the Pacific coast of Mexico, especially with my two daughters and, hopefully in the future, with my grandchildren. I lie for fun when I play with my granddaughter, Elena Paz. What is the quality you most admire? Engagement, faithfulness, witnessing each other’s lives—and presence. From my mother: “Whatever you do, try to do well.” I can hear her voice saying that. But I don’t think it’s a good motto, because it always slows you down. Also, “in the end, it will be fine.” That’s something I believe in. So it’s a good thing to think that way because I can trust it won’t always depend on me.